Accurate understanding of soil processes is critical for predicting climate-ecosystem feedbacks. 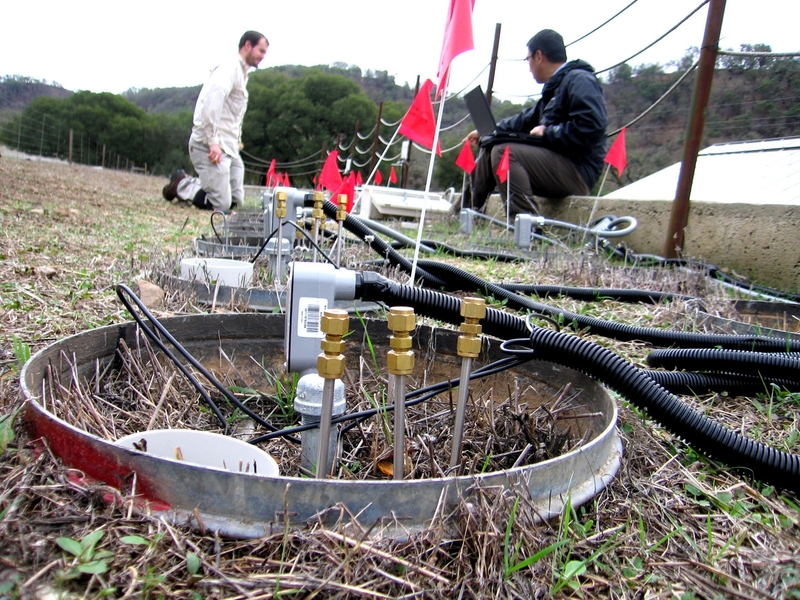 Here at UC Hopland Research & Extension Center, there exists a 72-tank lysimeter structure that is currently used in support of two research projects. One of those research experiments has 4 replicates of 9 treatment combinations made from three environmental factors and three substrate factors. This project's title is: Impacts of soil warming and plant rhizosphere on root decomposition and soil organic matter dynamics at different depth. In simple terms, the researchers are using ambient soil temperature, heated soil temperature, plants or lack-of-plants, surface disturbance, and additional root litter at different depths, all in various combinations, in order to improve scientific predictions of the feedback between soil carbon cycle and climate change. Such predictions can help mankind as global warming continues to alter natural processes. The experimental design called for the placement of heaters and probes in some of the lysimeter tanks, as you see here in the photograph.